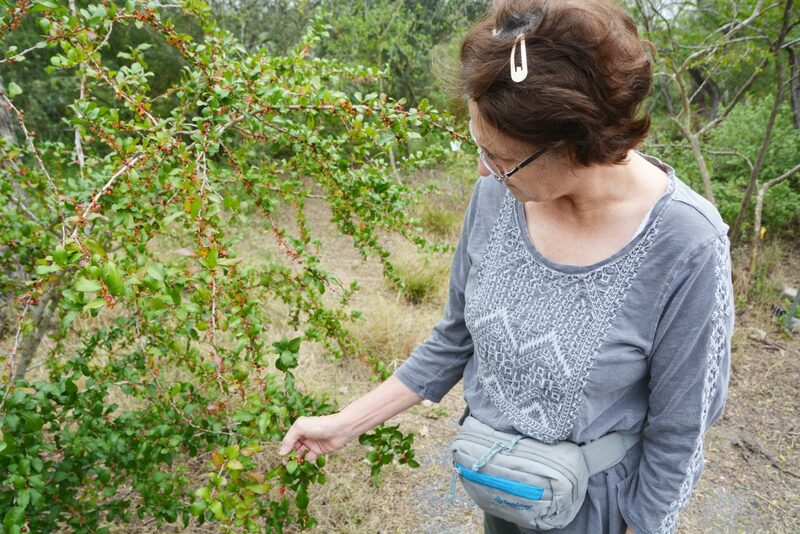 Christina Mild, a Texas Master Naturalist and an expert on native Rio Grande Valley plants, points out the purple-black berries on holly brush at Hugh Ramsey Nature Park. HARLINGEN — Hugh Ramsey Nature Park isn’t your usual lunch spot, but with Texas Master Naturalist Christina Mild, dining al fresco is always a possibility. “This is one that has some fruit on it right now,” she says. “These fruits should become a little bit larger. See the one that is turning dark? When they’re almost black they will be very tasty. That’s brush holly. Mild is an expert on native plants, especially edible native plants. She will be one of the presenters on the subject at the upcoming five-day Winter Outdoor Wildlife Expo at South Padre Island Birding and Nature Center. If Mild has a home park, it’s here at Hugh Ramsey. Along with other Texas Master Naturalist volunteers, she comes weekly to work on pruning and clearing to keep the place attractive and accessible. She can be a little protective. A lunch-time trek through the park reveals a surprisingly varied menu. There are Texas persimmons, and then wolf berry or even Mexican olive, if one is hungry enough. In her tours Mild says she often lets children take some berries from the plants she knows are not just edible, but tasty. “Kids love this idea of being able to harvest something for themselves that’s edible,” she says. Widespread admiration for native Rio Grande Valley flora has not always been the case when it comes to garden plots. After all, in the early 1900s almost the entire Valley was cleared of its dense thorn scrub to usher in a new agricultural age. But the mood is changing, and there is a growing acknowledgment of the importance of planting and nurturing the old plants when it comes to gardening, at least if one hopes to attract native bird and butterfly species. The first day of the WOWE expo on South Padre Island is devoted to plants and pollinators. In addition to Mild, experts Mike Heep (native plants), Ethel Cantu (landscaping with native plants), John Yocum (butterflies), Chuck Malloy (palm trees) and Jennifer Herrera and Janet Schofield (composting) all will be leading seminars on their specialties from 9:30 a.m. to about 3:45 p.m.
For Mild, those willing to propagate native plants in home gardens are bringing a welcome change in philosophy to the Valley.